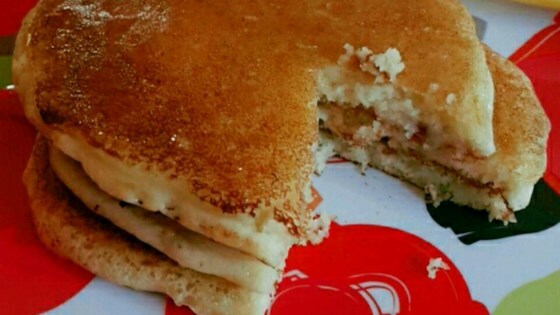 "This is a quick and easy recipe for pancakes using self-rising flour." Beat eggs, oil, and milk together, and add to flour. Stir until combined. Heat a greased griddle until drops of water sprinkled on it evaporate noisily. Pour 1/8 to 1/4 cup batter onto the griddle. Turn over with a metal spatula when bubbles begin to form on top. Cook second side to a golden brown color. How this recipe currently has 4.5 stars, and I don't know how. I never knew pancakes could be this flat, greasy! Absolutely horrible! Total waste of ingredients and time! Wish I could give it 0 stars. They were as thin as paper and had a nasty taste.